AMAZING home with GREAT amenities in a WONDERFUL location. 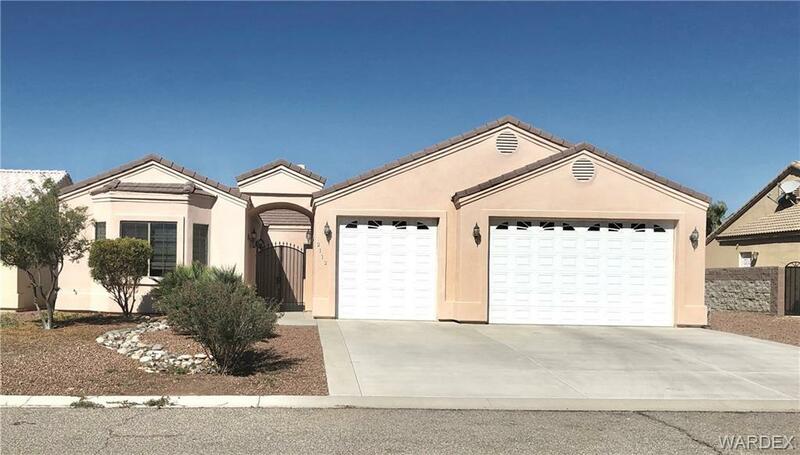 Featuring 3 car finished garages with 2 long bays and 9' plus doors. Side RV and Boat parking provides additional personal room to store. Beautiful gated entry court yard, Fire place, All granite kitchen and bath tops with large serving counters and updated appliances. Open design creates an inviting living room that opens up to a full size covered patio ideal for family and friends gathering. Huge pool size backyard with a wall of greens for privacy. Designated dining area could be used as an office or play room. Private part of the home consist of 3 large bed rooms and 2 full baths plus a powder room. High ceilings with C-fans, Dual pane windows, indoor laundry room with tons of storage cabinets and deep sink. Window coverings and shades throughout the home, Designer large floor tiles and carpet in the bedrooms. Master bath has a jacuzzi tub and a tiled walking shower. Large storage closets in bedrooms with designer furnishings that could be purchased separately. Location offers 5 championship Golf Courses around, Major retailers like Walmart, Safeway, Smiths and CVS. Valley View hospital, variety of restaurants and Memorial bridge to AVI resort and Casino on the Nevada side. Minutes to Colorado river, boat launch and 90 miles to Las Vegas. Near Huukan Golf course with no HOA. Home is partially used as a winter getaway and is in a great shape. A wonderful place to call home.